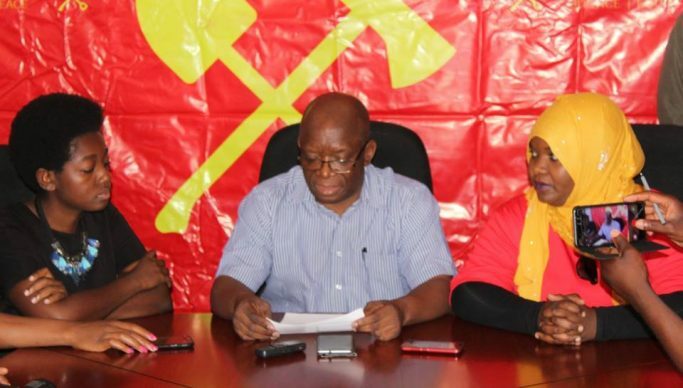 The Socialist Party has called upon the trade union movement in Zambia to rally behind their Zimbabwean colleagues who have been arrested for showing solidarity on the plight of the workers in that country. Addressing journalists at the party secretariat in Lusaka this morning, General Secretary Cosmas Musumali challenged Zambian trade union leaders to stand with their colleagues in such hard times. Dr Musumali said if left unchecked, what was going on against the unions in Zimbabwe would affect their Zambian counterparts as well. He said the party had followed the Zimbabwean events with great sadness and revolutionary concern particularly how the Zimbabwe Republic Police (ZRP) arrested the ZCTU president, Peter Mutasa, and 35 others for allegedly intending to take part in the countrywide demonstration against the government’s two per cent tax on electronic transfers and rising poverty levels. Dr Musumali said those arrested together with Mutasa also included his Secretary General, Japhet Moyo, and two others who were seized by anti-riot police after they had cordoned-off the Zimbabwe Congress of Trade Unions (ZCTU’s) Harare headquarters. “These sweeping arrests of the trade unionists were unnecessary brutal, irrational and have taken away any remaining hope that the poor and struggling masses of Zimbabwe can expect any positive change from the current ZANU-PF ruling clique,” said Dr Musumali.